“He straddled his bicycle and started off. “Ted was born in Braunschweig, Germany on April 23, 1923. His father Wilhelm Bachenheimer was a German Jew; his mother Katherina was of German ancestry. Ted had one brother, Klaus Gutman Bachenheimer, who was born on July 24th, 1926. The parents were in theatrical work. “Due to the Nazi pogrom against Jews in Germany in the mid-30’s, Ted’s dad fled Germany to Prague, Czechoslavakia. And, because his mother was not Jewish, she and the boys had no trouble joining him there. The family then went to Vienna for two years, and in 1934 they sailed on the SS Majestic from Cherbourgh, France, to the U.S.A., arriving in New York City, and soon after settled in Hollywood, CA. Ted studied drama at Los Angeles City College, and when the Japanese bombed Pearl Harbor he join the U.S. Army. Shortly afterwards he volunteered for the army paratroops, and after taking his jump training at Ft. Benning, GA, he was assigned to the 504th PIR at Ft. Bragg, NC. “I came out of Class Nr. 38 at Ft. Benning, and was assigned to “A” Co, 504th. It was there at Ft. Bragg that I first met Ted Bachenheimer. He was teaching an intelligence section that I was assigned to, taking us out in the woods and teaching us material from the German army manuals. I believe Ted was assigned to Regimental Hq Co because of his fluency in the German language which he had acquired as a child. “I didn’t see or hear much of Ted until after we made the beachhead landing at Anzio. It was there that Ted seemed to find his niche. The beachhead was stationary for over the three months that we were there, and Ted just loved to go out on patrol and bring back prisoners. I was a Corporal at the time and with about 12 others we went out on a night patrol with Ted leading the way. As we slowly made our way through a German minefield, I remember one of our newcomers (to the front) saying, ‘Look, we are going through a German cemetery. See the crosses down there.’ I told him, ‘Cemetery, hell, those crosses say ‘Achtung Meinen’!’ Somehow we got through that minefield without any casualties. “We were soon pretty deep in German territory, walking very quietly when we suddenly heard some gutteral voices, and we all hit the ground. About 20 yards away we could faintly see about a platoon of German soldiers. They were relieving their outposts with fresh troops. After they passed on, Ted told us to stay put, and he walked up to a German outpost and, speaking German, asked the two men in the foxhole for a light for a cigarette. When they went to do so, he quietly told them they were his prisoners. “We headed back to our own lines, Ted got ahead of us with the prisoners and we lost sight of him. Meanwhile someone didn’t tell our own artillery that we were out there on patrol, and we started to get artillery coming down near us. That wasn’t bad enough, but every third or fourth one was a phosphorus shell. Now we’d been under German artillery fire before, but when it comes to firing for effect it is hard to beat American artillery fire. Those shells were dropping all around us, but somehow the worst that happened was that some of our guys got their jump suits scorched and that, sad to say was real traumatic for there were no jump suits available from supply. They had to wear ‘leg’ fatigues! “That wasn’t the only thing that happened. On the way back, we came to a dirt road and had to lay down in a ditch beside the road to wait for two stragglers from our patrol. While laying there waiting we heard the noise of German boots coming down the road, probably a German noncom checking on his outposts. We had every intention of letting him walk past, but one of our men took the safety off his M-1 and the German looked over at the ditch and said, “Was ist?” Well about ten guys let loose, and our stragglers told us they saw fire coming at us from behind the German. Soon it seemed that every German outpost around there fired their weapons at or around us. Luckily we were all in defilade, and their rounds went over our heads! “After a while when the fire ceased, we slowly made our way back to our own lines. Ted went out on many patrols behind the lines while we were at Anzio, mostly by himself and most of the time bringing German prisoners back with him. And only he, if he were still alive, could tell us what happened on those occasions. “The 504th PIR was pulled off the Anzio beachhead about April 1944 to join the rest of the division in England. We landed in Liverpool about April 29, 1944 and were then put on trains and shipped to the town of Leicester. They quarantined us for two weeks before we were allowed into town. We trained there making several practice jumps, but because we were understrength we missed going into Normandy. “Right before the Market-Garden jump into Holland, Bachenheimer and I were in the hospital together with minor ailments. While sitting around talking, I suggested to Ted that our commanders send in a platoon of paratroopers to try to assassinate Hitler. Ted said no, that wouldn’t do, it would only make a martyr of Hitler and the Germans would hang tough. According to A. Visser, who also cited N. A. Groot’s “Like Stars from Heaven,” it is presumed “that Bachenheimer entered the city of Nijmegen by the isolated railroad track. He ended up at the transformer factory of Willem Smit. There was a light burning in the factor at four o’clock in the afternoon. And Ted decided to take a closer look. “To the astonishment of the personnel who were still present, Bachenheimer suddenly walked in, dressed in full paratrooper uniform. Again, it shows that master scout Bachenheimer had an excellent sense of where to explore, because these very factory offices proved to be the center of an underground Resistance group in Nijmegen under the direction of engineer Verlee. They immediately updated him on the activities of their group, and Bachenheimer decided to stay with them. They told him that they would willingly follow his directions, and that he should assume command of their unit, and thus he became ‘The General of the Dutch Army’! “The next day, Tuesday, September 19, 1944, British tanks arrived in Nijmegen. The Dutch underground forces also came into action at that time. Ted managed that day to rid the railroad station of German troops. It happened this way. 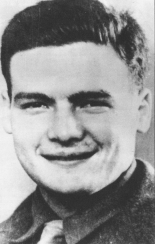 He and two others took some guns and ammunition from one of the trains, and thus armed with those weapons, they carefully crawled to Post J, from which post they could operate the loudspeakers in the platforms, ‘Come out, hands up, or you’re all dead!’ And Bachenheimer even fired a few shots from his Tommy gun. The American Weekly journalist Martha Gellhorn wrote, “his headquarters was a small overstuffed room in an old Nijmegen school. Two other twenty-year-old boys worked with him in that room. They ate there, with their weapons and grenades hanging on the walls. The corner of the room was piled with souvenirs. I once heard Bachenheimer question a prisoner, and I never saw a job better done. Then he received a German informant from whom he wanted to obtain certain information about nearby German defense installations. After that, two officers from other regiments arrived. They also wanted to get information, but they ended up in a dispute over a patrol they wanted to send out. Bachenheimer insisted that he did not think the proposed soldiers were fit for the job. From time to time English officers, Dutch resistance fighters, and Dutch citizens came with various requests: to arrest a certain betrayer, or to release some person from prison who had mistakenly been arrested. No detail was too large, or too small for Bachenheimer, who was a very capable and serious human being. Neither could anyone shake his modesty. His previous experience for this line of work consisted of one little job in the United States. He had been press agent for a show, but the show was a total fiasco. A. Visser picks up the narrative again: “During the last days of September Bachenheimer was again scouting…Again and again he crossed the Waal River near Betuwe which was still occupied by the Germans. Near the village of Tiel he became acquainted with the Ebbens family. Through them he made contact with a Canadian lieutenant, Heaps, and a British officer, Baker. These men, together with Dutch resistance fighters, had organized an escape organization called ‘River Line.’ The organization saved paratroopers who had been left behind in Betuwe following the unsuccessful action at Arnhem. “The escape organization, ‘River Line,’ assigned to Ted the task of installing telephone cables behind the German front line. He worked closely and together with the Dutch underground organization at Tiel, which was led by the fruit farmer, Ebbens. The command post of the organization was established on the Ebbens fruit farm. “On October 16th this command post was attacked by SS troops. Bachenheimer, Baker, a neighbor van Santen, and the entire Ebbens family were taken prisoner. Bachenheimer started talking immediately after their capture. He spoke in fluent German. ‘I’m sorry,’ he said, ‘but Captain Baker and I folled the Ebbens family into thinking we were German officers. You must let these people go. They are innocent!’ The prisoners listened to Ted’s please in astonishment—but the SS troopers did not let anyone go. They laid an ambush around the Ebbens house and that same night a truck carrying ammunition slipped into the fruit farm and drove right into the arms of the Germans. There was an intense firefight. Luckily, the resistance fighters who were driving the truck all escaped, but out of revenge the Germans set fire to all of the Ebbens’ buildings. This caused ammunition that already had been stored in one of the buildings to explode. After that, of course, the Germans did not free any of the prisoners, for this had disproved Bachenheimer’s statement to them. An article by the name of “The Legendary Paratrooper” written by Bill Francois and published in V.F.W. magazine in February, 1961 takes the story a step farther. “They (Baker and Bachenheimer) were taken to an internment camp at Amersfoot, 45 kilmeters away, and held there awaiting shipment by train to Stalag XI B at Fallingbostel. “Bachenheimer was placed in one railroad car with other prisoners, while Captain Baker was sealed in another. During the slow train trip that night the American private succeeded in prying screws from a wooden frame over a window and escaping. A. Visser’s research does give some final insight into Ted’s death. According to the archives of the village of Oldebroek, on October 23, 1944 it was reported to townsman Johannes Huurman that an American corpse with two gunshot wounds, “one in the back of the head and the other in the neck,” had been found. A. Visser states, “Bachenheimer had been shot on the evening of October 22, 1944 at about nine o’clock in the evening on the Eperweg. There, a German army armored car stopped in front of the house occupied by the Llange family. They heard a few shots but did not dare to go outside. 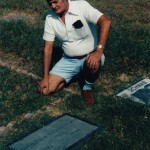 Ted Bachenheimer had been shot there on the side of the road. “Three weeks later Bachenheimer’s division left the Nijmegen sector…His fellow soldiers never learned what had happened to him. His name, throughout the remainder of the war, was carried on the records as missing in action. In 1946 or 1947 Bachenheimer was reburied in the war cemetery at Neuville, Belgium, fourteen kilometers south of Luik. At the request of the family, in 1949, the body was disinterred and moved to the United States where he was buried in the Jewish cemetery, Beth Clam, in Hollywood, CA. “The pupils of Petra school (in ‘t Harde, Holland), the sixth graders (seniors) honor him, and all who offered their lives for the freedom of our country and our people, when on each 4th of May, as a silent homage, they put their flowers by the cross that marks the place where he fell. Fred Baldino finishes the account. “When I landed in the States in January, 1945, a Red Cross nurse came up to me and said, ‘Did you know Ted Bachenheimer?’ I answered, ‘Yes, why?’, and she told me she was his aunt, and asked if I knew what happened to Ted. I told her that all I knew was that he was reported Missing in Action. She gave me Ted’s mother’s address in Hollywood, and when I got convalescent leave I visited my sister in Burbank, CA and went over to Hollywood to visit Ted’s mother. We had quite a chat, and at that time she felt confident that Ted knew the German hills pretty well, and that he would find his way back to our lines. It turned out, as we all learned later, that Ted was captured and while on a German truck being taken to a prisoner of war camp, he tried to escape (presumably) and was shot. A friend of the 82nd Abn Div in Nijmegen, Jan Bos knows the story well and tells me there is a marker where they first buried Ted. “After the war, his body was shipped back to the U.S., and he is buried in the Jewish Cemetery in Hollywood, CA. *Quoted verbatim from Fred Baldino’s records including “Odyssey of the Pfc ‘General”! (A Story of an ‘airbone’ Hero)” published by the The Airborne Quarterly Magazine, “Voice of the AAA and Digest of the Airborne World”, Summer 2001, by Fred Baldino and using accounts compiled by A.Vissier, a school principal in the Netherlands.